How do we create meanings? How do we perceive meanings? How do we experience these meanings? In any act of communication there’s a source, a sender, a message, a channel, and a receiver. The poetry film artform provides a means of exploring complex inter-semiotic relationships. Visual design elements such as shapes and lines can be as effective as letters and words, and design principles are rooted firmly in the psychology of perception, so, there are good reasons why certain elements are more powerful than others. Shapes and forms are essential to visual vocabulary and visual grammar, and knowledge of design rationale and design thinking can help to create stronger visual artworks. It is important to note that absence is as valuable as presence in a semiotic context, for instance, silence is the absence of sound, the aural equivalent of the white space employed by gallery architects and by graphic designers, which can be very effective when used as a strategic element. In this context, why does there seem to have been such a sudden rise in the popularity of poetry and film hybrids in recent years? Why are more people, Generation Z and beyond, turning to poetry and film to find means of expression in today’s media-saturated society? In the book The Sixth Language, the media ecologist and evolution specialist Robert K. Logan argues that speech, writing, maths, science, computing and internet use form an evolutionary chain of languages, and that new languages arise when information overload occurs, and the previous language can’t cope. New processing systems and new languages become necessary. We could take this idea further by suggesting that perhaps new artforms become necessary. The term ›media ecology‹ refers to the study of how communication channels affect human perception and understanding. Media ecologists argue that social and political change is actually caused by the current state of communication technology. The Sapir-Whorf hypothesis, developed by Benjamin Whorf, suggests that not only do language and grammar influence the way we form thoughts, but that language and grammar actually determine our thoughts, and determine our cognitive and perceptual abilities. The idea that the structure of language determines what people are even capable of conceiving is illustrated by George Orwell’s dystopian novel Nineteen Eighty-Four, in which Newspeak is the fictional language designed to limit freedom of thought. This raises bigger questions … as a result of technological and social changes, is the way we think, and what we are capable of thinking, changing too? Crucially, variations occur in the reception of communicated transmissions because all signs need to be interpreted. The receiver of any meaningful transmission, or, any audience of a poetry film artwork, has to decode the full richness of the meaning and its associations through complex cognitive processes. The meanings we send and receive are not fixed. The receiver is fully involved in the decoding, and the decoding is dependent on perception. Communication has always been multi-modal; however, today we seem to be moving towards an unprecedented consolidation of modes, and technology enables us to navigate these modes more easily. 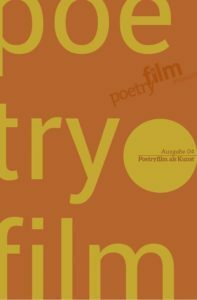 The understanding of semiotics and multimodality provides rich and valuable means for focussing and articulating critical readings of poetry film artworks.